Here at Ayoba Industrial we are one of South Africa’s largest suppliers of Ingersoll-Rand Pneumatic Tools. Ingersoll-Rand has provided quality equipment to various industries for over a 100 years and has a strong reputation for high quality tools, which provides excellent performance, even on the toughest jobs. Ingersoll-Rand’s aim is to provide clients with complete solutions that will maximize your productivity and ensure efficiency and safety when completing your tasks. Below is a list of the Ingersoll-Rand Air Tools & Equipment that Ayoba Industrial has to offer. We are fully certified to maintain, service and repair all the Ingersoll-Rand Equipment mentioned below and stock all the necessary parts and accessories to do so. Ingersoll-Rand Impact Wrenches are designed to provide high performance, durability and comfort. They are the best in their class with their power-to-weight ratio and also has the best in class short length. These cordless impact wrenches are specifically designed for vehicle services, industrial maintenance, machinery installations and repair and manufacturing applications. The Ingersoll Impact Wrench has an extended-life, 20V lithium-ion battery, along with intelligent battery management. It also comes with a charger that can be mounted to the wall or bench. Here at Ayoba Industrial we sell a wide range of Ingersoll-Rand Grinders, which includes the Revolution Series, G-Series and Pro-Series Grinders. The Ingersoll-Rand Revolution Series Grinders are known for their Power, Performance and Comfort. They have powerful 0.3 hp air motors and offers the torque and muscle required for jobs, such as automotive, metal fabrication, shipbuilding, plant maintenance and a variety of other applications. Our G1, 2 and 3 Series Grinders can handle anything from small to large jobs, depending on the series. They also come in different configurations, such as angle, horizontal and extended horizontal or in the case of the G3 Series, extended angle. Our G1 Series has 0.4 hp, the G2 has 0.8 hp and the G3 has 1.35 hp. Our Pro-Series Grinders include the Pro-Series 88 and 99, the Pro-Series 77 and the Pro-Series 66. The Pro-Series 88, 99 and 77 have patented stainless-steel motor controllers with industry’s only lifetime guarantee. They have self-locking throttle levers, which prevents accidental operation and also a built-in mist lubricator that automatically oils the motor each time the tools is used. In the case of the Pro-Series 61, it has a patented stainless-steel motor controller that is maintenance- and adjustment free, it’s heavy-duty, double-row ball bearings assures long life and smooth operation. This series also has a built-in lubricator that automatically oils the motor when the throttle is activated. Our Accessories for these grinders and other equipment include Type 1; 27; 28; 6 and 11 Wheel Accessories, as well as finishing tool accessories. Our quick change abrasives include Backer pads, a wide variety of sanding discs, surface prep discs, quick strip discs and high strength buffing discs. Ingersoll-Rand’s high quality range of production drills are designed for continuous use in the most demanding industrial applications. These drills are well-known for their high quality, comfort, performance and long term accuracy. The Q2-Series Air Production Drill has a lightweight design with a soft-touch grip handle. They also have an excellent power-to-weight ratio and can run at speeds from 500 to 5100 rpm. The P33-Series Production Drills are more powerful with a wider selection of rotational speeds up to 18 000 rpm. This drill is suitable for precision drilling applications, yet it is still a compact and lightweight tool with a with variable speed control. Then there is the P33-Series Air Modular Drill, which has 6 piston motors, 8 in-line motors and 21 unique interchangeable heads, so you can configure the drill to suit each application. It also comes with a sensitive and progressive trigger or a lever for precise speed control. The P33-Series Air Precision Drill is based on the P33 modular series, but is available in 3 different angle configurations, which is 30°; 90° and 180°. This series also comes with a sensitive and progressive trigger or a lever for precise speed control. The large, heavy-duty drills are ideal for opening and closing large valves or even drilling large diameter holes that can be anything from 14mm – 76mm. The 22 Series has a selection of speeds to match all the necessary applications and its governed motor regulates air to the motor to keep the drill working at the peak of its power curve. The 33, 44 and 551 Series has roll throttles for speed control and has a strong, lightweight, heat-threaded aluminium housing for strength without weight. Ingersoll-Rand offers 2 types of Sand Rammers, namely the Bench Sand Rammer and the Floor Sand Rammer. The Bench Sand Rammer is ideal for compacting sand moulds in a foundry or casting facility. They are short in size and light in weight and comes with a long throttle. Other design features include a round piston rod, built in muffler and a double-action “sand wiper” seal. 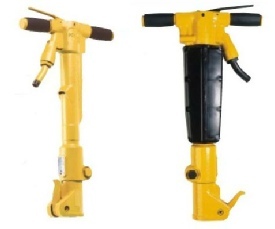 The Floor Sand Rammer has a longer handle, heavier stroke and is two times the weight. It’s easily held from a standing position, while compacting very large moulds at floor level. Ingersoll-Rand has a long history when it comes to construction equipment, such as Jackhammers or otherwise known as Pavement Breakers. These pavement breakers offer more power and have fewer parts than many of their competitive models. They have been designed to increase productivity by giving you more power and reduce running costs, by eliminating certain parts and costly wear items. These Jackhammers / Pavement Breakers come in classes that range from 35 – 50lb and 60 – 90lb. Then Ingersoll-Rand also has a newer Electric Pavement Breaker, which is easy to transport, has a 15Amp motor and shock absorbing handles, amongst other features. ARO-Flo mist-type lubricators help ensure that pneumatic devices receive the required lubrication to maintain peak performance, reduce wear, and prolong service life. They are designed to provide the correct amount of oil for most general applications in a pneumatic system, delivering a constant ratio of oil to airflow. Different Series’ of Lubricators include the 1000, 1500, 2000 and 3000 Series. 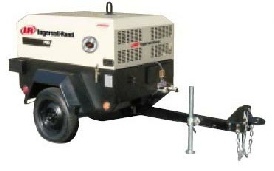 Ingersoll-Rand offers various Air Compressors for the Construction Industry. Reciprocating Air Compressors come in single- and two-stage configurations. The single-stage model compresses the air to a final pressure in one stroke and has a max pressure of 135 PSI. The design of this specific air compressor ensures cooler operation, extended pump life and makes it easier to maintain. The two-stage model compresses the air to an intermediate pressure during the first stage and removes the heat of compression through the inter cooler during the second stage, then compresses the air to a final pressure in a second compression stage. These air compressors are more efficient and more commonly used for pressures above 100 PSI, yet it has a max pressure of 175 PSI. The design on this air compressor run cooler even in demanding conditions, ensures extended pump life, runs smoothly and quietly and is also easy to maintain.